Y’all know I LOVE the clean-cut sophistication of a blazer but just add some interest with a checked print and you really kick it up a notch. Grab those basics from the wardrobe girl cos you’re good to go! 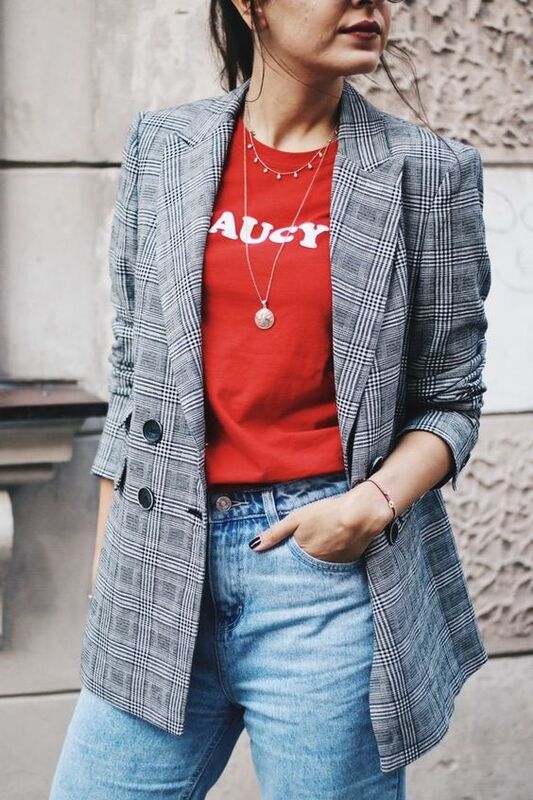 I picked up a checked blazer from Missguided at the start of Spring last year and it was the perfect transitional piece as we moved into warmer weather. I swapped the knits and jeans underneath to cotton tees and skirts (as seen above) or teamed with a slip cami dress and mules (my uniform when it’s an ‘I slept in and have 5 minutes to look presentable’ morning!). Ah the aforementioned go-to when running late! Also, a great way to bring a slip dress from Summer into Autumn before it gets too cold! The blazer I’m wearing in a current $49 Target one, but the thick material and cut make it feel very luxe. I went down a size to a 6 for a more fitted look. (Images sourced from Pinterest). Probably my favourite way to wear a checked blazer as I love the clean-cut but feminine combo. I’ve styled below with an old black Target skirt and a new Zara tan skirt. The best news is that the Zara one also comes in black and you can pick it up for $40 instore. They also stock the tan online (yep, Australia finally got an online Zara store! ), but it’s priced at $46- anyone else noticed the price differences online and instore? (Images sourced from Pinterest). Neutrals such as white and black are the no-brainers for checked blazers but I also love the colour pop from red and orange (more great leftovers from the summer wardrobe!). Next up on my combo it list are blush pinks, cozy tan and icy blue knits. (Images sourced from Pinterest). Ready to give the checked blazer a go? Shop my picks below! daily grind feat. Trade Secret.